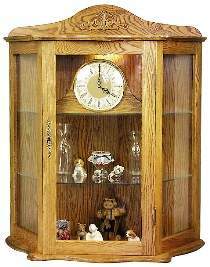 Make this combination display cabinet and clock to showcase and protect your prized collections, keepsakes, and momentos. Features glass on three sides for unobstructed view. Shelves are fully positionable to accommodate your collectibles. Wall mounting keeps clock and contents at eye level and makes access exceptionally easy. Plan features FULL SIZE patterns. Hardware package includes dual chime movement, clock hands, roman dial bezel, non mortise hinges, embossed oak ornament, surface mount lock, decorative key, key plate, shelf supports and cabinet light. Project plan, wood, glass, battery, screws, finish and second hand are not included. Measures 39"H x 33"W x 15"D.